Picket 43, from the director of so many good military movies. Now Major Ravi not interested to deal with war front movies. Picket 43 is a different kind of military background movie, which focusing the feelings of soldiers those who stands in borders to protect our country. 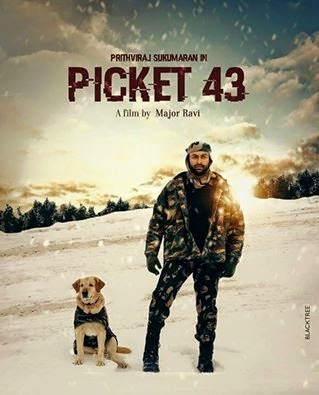 In Picket 43, Prithviraj Sukumaran in lead role as Havildar Hari. Havildar Hari is posted to Picket 43, one of the most dangerous outpost of Indian Border, his hardships to sustain and the bond he shares with his Pakistani counterpart unfolds the film. Pritviraj Sukumaran’s performance make the movie live. One man stellar show was this one from him in which he was so convincing and natural. Mostly at the climax scenes where he scores bigtime with his fine dialogue delivery. Renji Panikkar with his strong English uttering skills made a mark while Javed Jaffrey made his entry to the Mollywood through a lovely role. Rest of the cast including Anu Mohan, Shobha Mohan, Sudheer Karamana and Hareesh Peradi done their short roles okay. Major Ravi still is the best man to churn out the Military movies that matters in the industry. After a long Major Ravi is back by Picket 43 to the league which he once promised through his first 3 films. This is another good watch from this director who provides an emotionally heavy film which touches the hardships of an army man, patriotism, an unusual friendship and the untold unity between the countries. Ratheesh Vega's department done a plain job considering the genre of the film. Two soft melodies featured in the stretch of the film which synced with the mood. BGM was not so remarkable, could have done a better job. Ranjan Abraham's cuts were lacking the sharpness anticipated, it was a relief to see there were not many unwanted scenes or sequences in the movie. Jomon T John's camera was one of the major highlights of the movie through which he captured all the beauty as well as the darkness of the border.